The PhD curriculum in "Physical and chemical processes in Earth systems" covers a range of topics of interest in the Earth Sciences. These include mineralogy, geophysics, tectonics, geochemistry/petrology, structural geology, sedimentology, earth surface processes, and Earth Science Education (e.g., http://www.unicam.it/geologia/unicamearth/index.htm). PhD students in Earth Sciences are usually affiliated with the Geology Division (http://www.unicam.it/geologia/), which hosts research groups enjoying close connections with local, national and international partners. Moreover, the PhD programs in Earth Sciences include activities that cross interdisciplinary boundaries and include active collaborations with other Science Divisions including Chemistry, Physics, Mathematics and Computer Science. 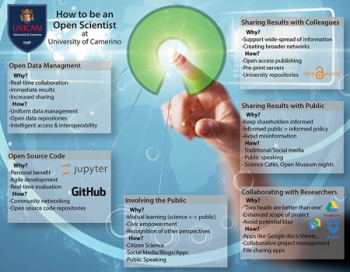 The overall philosophy is to try to treat Earth Science problems from a quantitative point of view, hence the important collaborations with other scientific disciplines, within Camerino, and also including valuable international collaborations for many topics. Employment prospects for PhD graduates include academic institutions, government and private research labs, private industries (petroleum, mining, materials science, environmental applications). Some PhD students in Earth Sciences are also involved in applied research projects (EUREKA), financed in collaboration with the Regione Marche, UniCam and enterprises of the Marche Region. Current projects include geothermal energy, hydrological problems, and work at the interface between seismology and building construction. 1980 to 1985 Research and Teaching Assistant, Department of Geological Sciences, Brown University, Providence, Rhode Island, USA. PhD in Geology, 1986, Brown University, Providence, Rhode Island, USA. ~ 70 publications in international journals, >5000 citations, h-index ~39 (March, 2015; Google Scholar). Main topics involve experimental studies of earth materials at high temperatures and pressures – phase equilibria, thermodynamics, gas solubility, kinetics. Fabbrizio A, Carroll M. (2008). Experimental studies of the differentiation process and pre-eruptive conditions in the magmatic system of Phlegreans Fields (Naples, Italy). Journal Of Volcanology And Geothermal Research, vol. 171; p. 88-102, ISSN: 0377-0273. Helffrich, G., J.-M. Kendall, J. O. S. Hammond, and M. R. Carroll (2011), Sulfide melts and long-term low seismic wavespeeds in lithospheric and asthenospheric mantle, Geophys. Res. Lett., 38, DOI:10.1029/2011GL047126. Burgisser, A, Oppenheimer, C, Alletti, M, Kyle, PR, Scaillet, B, Carroll, MR (2012) Backward tracking of gas chemistry measurements at Erebus volcano. Geochemistry, Geophysics, Geosystems, 13, 1-24. DOI:10.1029/2012GC004243. Agostini, C, Fortunati, A, Arzilli, F, Landi, P, Carroll, MR, (2013) Kinetics of crystal evolution as a probe to magmatism at Stromboli (Aeolian Archipelago, Italy). Geochimica et Cosmochimica Acta, 110, 135-151. Arzilli, F, Carroll, MR, (2013) Crystallization kinetics of alkali feldspars in cooling and decompression-induced crystallization experiments in trachytic melt. Contributions to Mineralogy and Petrology, 166, 4, 1011-1027. DOI: 10.1007/s00410-013-0906-1. Arzilli, F., Mancini, L., Voltolini, M., Cicconi, M.R., Mohammadi, S., Giuli, G., Mainprice, D., Paris, E., Barou, F., Carroll, M.R., (2015) Near-liquidus growth of feldspar spherulites in trachytic melts: 3D morphologies and implications for crystallization mechanisms. Lithos, 216-217, 93 – 105.